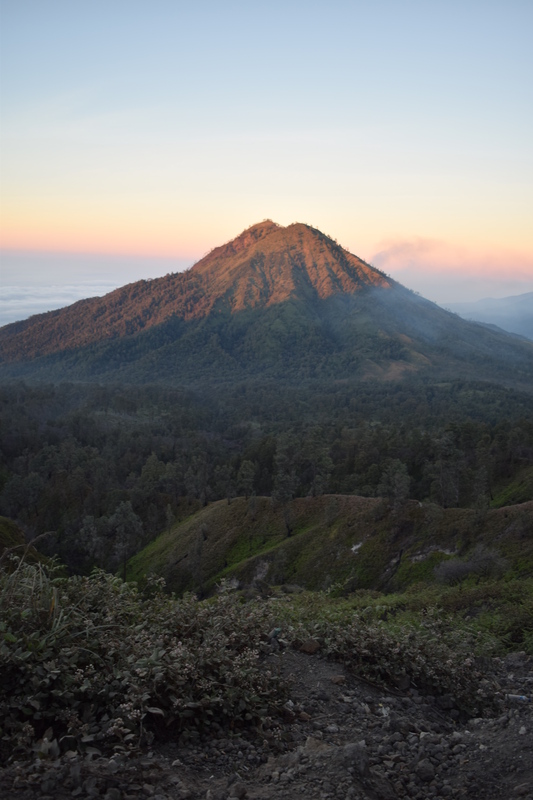 For some reason it hadn’t really occurred to me to do a volcano climb when in Indonesia. I’d planned mainly for just beaches and relaxation but when I heard about how spectacular some of the volcanoes in Java were, I sacrificed the Bali beaches and headed over to take on one of these bad boys. Ijen had been recommended to me as opposed to its much more frequently visited neighbour Bromo, plus it Ijen was easier to get to from Bali. Getting from Ubud to Gilimanuk, the Western Bali ferry port, was some journey! It involved taking a brown-coloured bemo to Denpasar (25,000 IDR), then a bemo to the bus terminal on the other side of the city (which I had to charter for 20,000 as nobody was around) and then finally a bus to Gilimanuk ferry port (60,000). The whole journey took around 5-6 hours. Luckily, the Bali-Java ferries run every 15 minutes, 24 hours a day. The crossing cost around 7000 rupiah and took about 45 minutes. On the Javanese side, the ferry deposited me in the wonderfully named Banyuwangi. This is the main gateway to Mt. Ijen. I arranged a guesthouse a few days before and decided to do my Ijen visit through them. Hotel Permata Indah is basic but cheap and with very friendly staff. The owner picked me up from the ferry port for free and was very attentive. A single room cost me 70,000 IDR and whilst there’s not much in the vicinity of the hotel, their cafe in front serves delicious and cheap food. For the Ijen tour, they provided a driver, gas mask (for the sulphur fumes) and torch for 175,000 IDR which was the cheapest I’d seen. On top of that, the entrance fee for the volcano is 100,000 IDR. So, in total, not a bad price for a jaunt up a volcano. Pick up water/supplies in advance as, whilst there was a small shop at the entrance, it was very pricey. 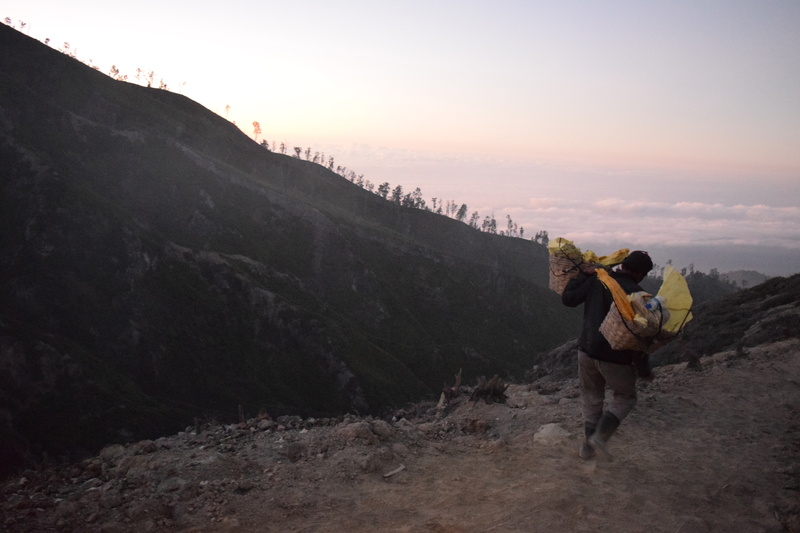 Hiking up Ijen requires a very early (or late) start. The hotel guests gathered in the lobby at 1.30am, ready for us to set off. The drive to the foot of the volcano took about an hour. I think we started a bit late because it took a long time to see anyone else. Unsurprisingly, I was about as unprepared for this hike as I could have been. Climbing a volcano hadn’t been part of my plan and so my hand luggage bag contained an assortment of t-shirts, shorts and other summer related things. It contained nothing which would be any way beneficial for climbing a mountain in the middle of the night. Even in the height of August, the climb was cold. Wearing a hoodie helped a lot, but some long trousers rather than shorts would have been much nicer. Even during the hardest ascent, my hoodie remained on. I was expecting Mt. Doom so was surprised at how green it was. My main worry was my footwear. Wearing Vans pumps for a daylight hike in Hong Kong was one thing but for a volcano?! I tried to borrow shoes at the hotel but everyone who worked there apparently only had one pair of shoes… which they needed. After being reassured I’d be fine by the people doing the tour (well they weren’t going to tell me not to bother, were they?) I decided to take the plunge. It actually wasn’t too bad. Obviously, something with a bit more grip would have been ideal as the gravel makes it hard to get a proper footing, but the ascent was pretty much problem free, even if it was in pitch darkness. It’s not the steepest hike I’ve done and it fluctuates quite nicely, with a flat period often following any steeper sections. The last 15 minutes is actually pretty much flat so it’s a nice way to finish before you reach the volcano crater. One of the many sulphur miners. Going down is a rather different story and resembles something from a slapstick movie. What comforted me was the amount of people who’d clearly spent a fortune on proper hiking gear still falling flat on their arses on the way down. A woman just ahead of me must have gone down at least 20 times – I’m not sure why she didn’t just give up and slide down. It’s pretty inevitable you’ll slip/fall at some point on the way down because the angle of the slope combined with the loose gravel makes it quite hard. Some people sprinted down, others (like me) shuffled at the pace of a paraplegic snail. Everyone seemed to make it down in one piece. And my God, it was worth it. I’d have happily fallen over dozens of times because the view at the top was like nothing I’d ever seen before. 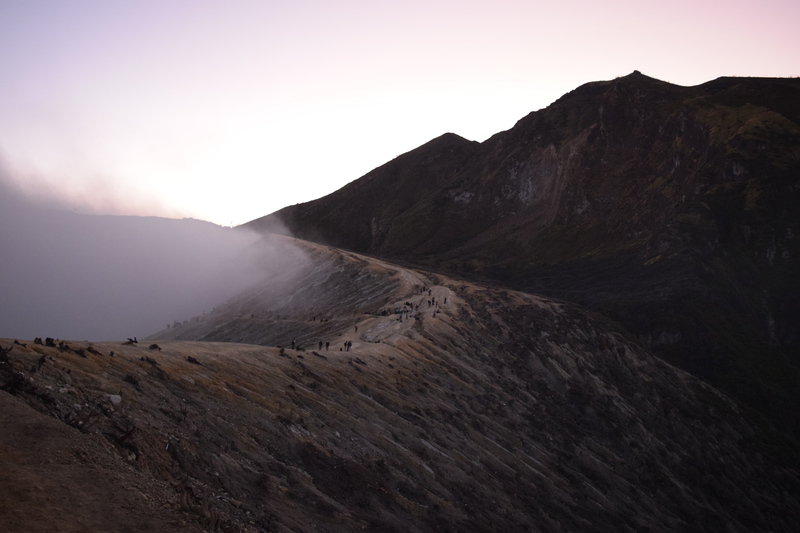 Ijen is famous for its blue flame, hence why the hike starts in the middle of the night. To see this involves an even steeper climb down into the crater which I opted not to do given my unsuitable footwear. Even without this though, the sheer audacity of standing on the crater rim of a volcano is a feeling like no other. The stink of the sulphur was strong, even penetrating my Bane-like gas mask, and the crater was just a plume of smoke, blocking the huge sulphur lake which sits underneath. Then, looking up, the sky is just a dazzling array of stars which slowly disappear as first light comes up and the sky dazzles an amazing combination of pinks and oranges. I’ve never seen the sky that colour before. Just ahead, I could see the glow of sunlight on the various other volcanoes dotted nearby (some of which were responsible for the recent airport closures across the country) and, as it got lighter, finally got a proper look at the incredible volcanic crater. The only trouble with being in a group is you all have to be down by a certain time (7am in our case). Had it not been for this and the fact I couldn’t feel my legs, I’d have loved to have stayed up there and soaked up what was by far one of the most awe-inspiring things I’ve ever seen. Usually sambuca shots and gin account for me rolling into bed at 8am, but today my all-nighter had a much more spectacular rationale behind it, and I wouldn’t have missed it for the world.